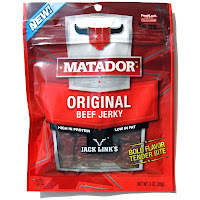 Matador is a brand name of Link Snacks, Inc. of Minong, WI. It's the newest product from the Jack Link's group of meat snacks, launching last March. The brand is intended to appeal to teens and early 20-year olds with an action-packed lifestyle of motocross, skiing, skateboarding, surfing, and the like. Link Snacks, Inc. apparently ran a taste test with teenagers to develop just the right flavor and consistency to push all the right snacking buttons. The company partnered with Frito-Lay to get this new brand of jerky into retain outlets everywhere. Beef, water, sugar, salt, brown sugar, maltodextrin, flavorings, monosodium glutamate, spices, smoke flavor, sodium erythorbate, citric acid, sodium nitrite. The first thing I taste from the surface of these pieces is a smokiness, followed by a faint sweet. With some sucking there's a light saltiness. The chewing flavor starts with a stronger saltiness, followed by an increased sweet. I also get an increased smokiness, and a light meat flavor. Overall, the flavor component that seems to be the strongest in this jerky is the sweet. However, I would not consider this to be a sweet jerky, the sweetness is perhaps moderate in intensity. It's just that compared to the other flavor components, the sweet seems to be the most noticeable, and mostly in the chewing. The smokiness seems to be the second-strongest flavor. But after eating a few pieces, the smokiness becomes more difficult to notice. It's after taking a drink of water, and pausing for 5 minutes, and the eating another piece that I can really pick up that smokiness. I'd give the saltiness the honors of being third-strongest, at a moderate intensity. The meat flavor I reported above is noticeable but light. It doesn't quite have that steak flavor, but something more closer to summer sausage, or a meat stick. 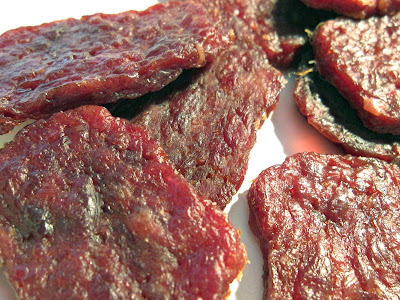 This jerky doesn't really pack in a lot of flavor, but moderate at best. The flavor is more like a summer sausage that's lighter on the meat flavor, and heavier on the sweet. This appears to be a chopped & formed jerky, pressed into shapes and sizes comparable to a Chicken McNugget, but sliced medium thickness. It's semi-moist jerky with a semi-moist surface feel. Being bite-sized, it's not necessary to tear apart, however they're still very easy to tear apart, and likewise very easy to chew. The chewing texture starts out soft and plastic-like. Just a few chews and these break down quickly, and soon renders into a soft mass. At that point, it takes on a meaty consistency, but mushy, more like a meat-loaf that didn't fully cook all the way through. Being chopped & formed, I can see blotches of dark and light while holding this jerky under a light. I don't know what the dark blotches might be, but I can recognize the lighter-colored chunks as connective tissues, like gristle, cartilage, and tendon. I did not, however, encounter any hard crunchy bits. I paid $5.99 for this 3oz package at a Walgreens store in Menifee, CA. That works out to a price of $2.00 per ounce. For general jerky snacking purposes, at the $2.00 per ounce price, this seems to provide a fair value. I get an average amount of snackability for its ok flavor, easy eating, and decent meat consistency (for a chopped & formed jerky). The $2.00 price per ounce is a little bit higher than what I'd pay at the grocery store, instead of the drug store where I got this, and as such still seems higher than what I'm getting out of it. This Original variety from Matador Beef Jerky seems to provide enough snackability through a flavor that's good enough to snack on, and an easy-to-eat consistency. It's not anything that's going to impress you, but I don't think it'll gross you out. I could a eat through a bag of this while watching television, and still keep my focus on the television. As for a jerky that's intended to appeal to teenagers, I guess I can't comment on that. Compared to regular old Jack Link's jerky, this stuff does seem a little more sweet, and a little more smoky, a little more moist, and far more easier to chew. Being an avid motorcycle rider, I could definitely wander into a convenience store after filling my bike up with gas, pick up a bag of this and wolf it down in a minute, just to keep the hunger at bay. Though I doubt I'd pay $5.99 for this. But it seems like Matador Beef Jerky might well be successful. But to enjoy it for it's flavor, it's chewing, it's consistency, it's neither good nor bad. I think a good beer pairing for this is a porter. "Gob-ba-da Gob-ba-da" "Get your red hots here"
I find these to be more tender than most dry jerky, easy to eat, and satisfying compared to the calorie content per ounce. The taste is one of the best I've ever experienced, I came here by googling them because I want to know where I can get larger packages of the stuff. Right now it seems like it's all small individual packs. I have fell in love with this beef jerky.The one thing I love the most is the moistness of the meat and the taste.It makes a very good low cal,low fat,low carb snack.I am seaching online to see if I can order in bulk.Thumbs up to Jack Links Matador! I was grocery shopping yesterday and came across a rack or stand of jack links brand of jerky Matador and a good portion of the bags were cloudy, so I picked one up and it was all moldy green, not just one bag but several YUCK! it was the BBQ Brand. Why did they switch to chopped and formed beef jerky in the first place it doesn't even look appealing. By selling this jerky in the chopped and formed fashion the company is able to use all the meat and barely anything is wasted, that's the reason they switched it aslo saves the company money and labor. You can have a machine push out this type of jerky in stead of a crew of ?? How many Bottom line saving money! Tried the teriyaki version of this, perhaps the worst jerky I've ever eaten. Chopped and formed doesn't count as real jerky. 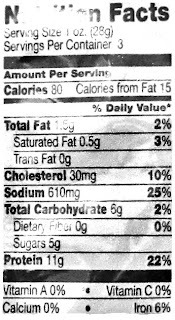 Shortly after eating a small $3 bag, I got a mild headache from the nitrites. bad, bad, bad. Being someone that falls under the category of teen/20's, I must say, I am not attracted in any way, in fact, perhaps even repulsed. My sister had bought a bag while we were at the campground and offered us one. We had to go back to the store and by the last 2 bags left. They are so good my 13 year old son loves them. I went on line to see where we can buy them locally. Tender, great taste and great snack. They are disgusting and expensive, when chewed it turns into a nasty mush. 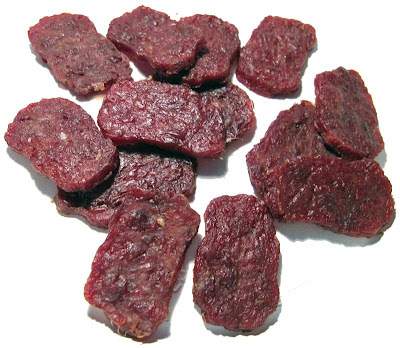 It is NOT real beef jerky, it's ground up leftover meat byproducts formed into discs. I would take Jack Link's over this any day. The Matador meat sticks are nasty as well, Slim Jims are better. Do a review of Matador Beef STICKS, awesome, the best ! I taste Liver in this disgusting, poorly textured "Beef Jerky". gross, tastes like dog treats and smells worse then them. This is NOT beef jerky. Beef Jerky is THIN and you can chew on it for awhile. This stuff is too thick and falls apart. You should rename it "Matador Beef Chunks" because this stuff IS NOT JERKY!! Sad & disappointed. I'm sorry, but I love this beef jerky. I don't want on something I can't chew away. This is the tenderest jerky and I love that. I love that there are no strings in it that you can't chew. I have tried 4 other brands and this is by far my favorite. It's great for eating when you are on long drives.